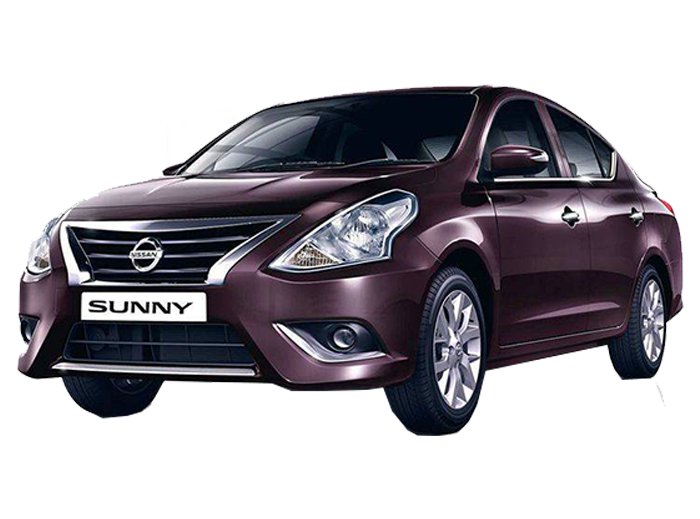 New Nissan sunny Car in 1498 cc Engine, Manual and Automatic Transmission, ABS with EBD. Rear Parking Sensors, Multi-Function Steering Wheel, Power Windows, Alloy Wheels. To make the cabin more desirable Nissan have stuffed a string of features including electric power steering, manual anti-dazzle mirror, steering tilt adjustment, rear centre armrest, driver side armrest, electrically adjustable door mirrors, power windows in front & rear with driver auto up & down with anti-pinch, auto AC, remote keyless entry, intelligent key with push-button start, rear parking sensors, rearview camera, height adjuster for driver’s seat and 12V accessory socket. Inside, it gets a wide 2 DIN audio system with USB port, Aux-In and display are integrated inside. Speed sensing volume compensation, Bluetooth connectivity, steering mounted audio & handsfree phone controls, four speakers are also equipped in the cabin. Compared to the 2011 version, the current model has a relatively modish front profile with a tweaked front grille, redesigned headlamps and fog lamps with chrome housing. Look from the side is appealing, the chrome door handles and sharp shoulder line works well for it. Rear side sports large swept-back tail lamps, steeply raked windshield, and large body painted bumper. Inside, it gets leather upholstered seats, beige toned dashboard and piano black center console. There is a comfortable room for occupants seated in front and rear. In terms of tech, Sunny equips a string of comfort and infotainment provisions.